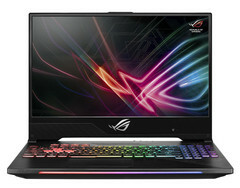 One of the ROG gaming laptops that will get the slim display bezels this year is the GL504 model which has not yet been officially announced, but it is very close to launch since it is up for pre-order at a Polish e-tailer. The specs include everything gamers need right now, from15.6-inch IPS screens with 144 Hz refresh rates and hexa-core CPUs, to GTX 1070 GPUs and NVMe + SSHDs. storage combos. Since thin bezels are trendy for gaming laptops right now, more and more OEMs are updating their models to reflect this tendency. Asus needs to stay on top of things and will soon release some updated models featuring thin bezels, including the ROG GL504. This model has not been officially announced yet, but is appears to be up for pre-orders at a Polish e-tailer. Spec-wise, the GL504 model gets the latest 8th gen Core i5-8300H / i7-8750H CPUs from Intel, and users may add up to 32 GB of DDR4-2666 RAM, together with storage combos comprising up to 512 GB NVMe SSDs + 1 TB SSHDs. As any respectable Asus gaming system, the new GL504 will sport either the GTX 1060 or the GTX 1070 GPUs. The i7-8750H + GTX 1070 + 256 SSD + 1 TB SSHD model can already be pre-ordered in Poland for around US$2300, and should soon be launched in North America for US$2000.